Good morning! This is my card for this week's Twisted Tuesday challenge. This week's challenge is to create creation with chocolate in mind. 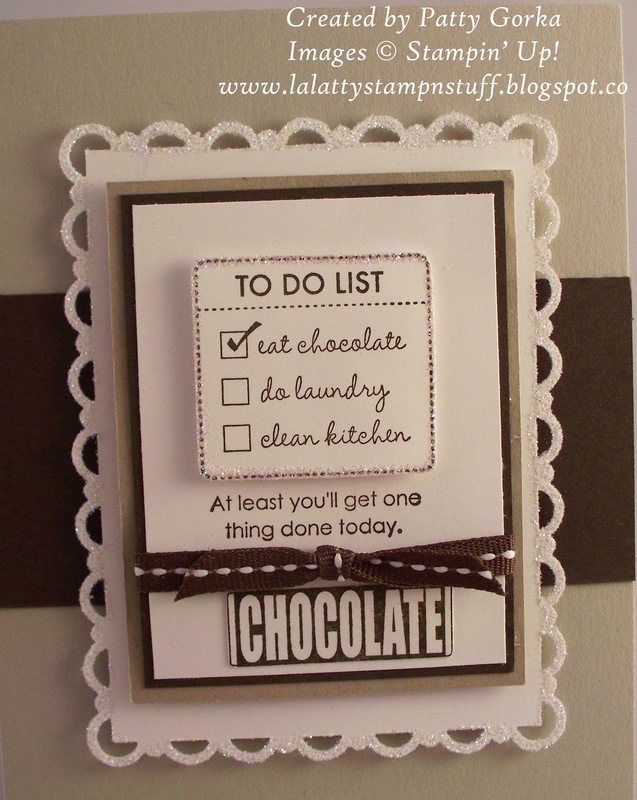 This could be chocolate card stock, patterned paper with chocolate on it, an image with chocolate in it, etc. The Twist this week it so use glitter on our creation. I used a retired Stampin' Up! stamp set called 'Eat Chocolate'. I stamped the image onto my card stock and then I stamped it again on a scrap piece of paper and then I cut out just the 'to do list' part of the image and using dimensionals I placed it on top of my original stamped image. I did this to make part of my main image pop up. The candy bar is part of another image in the same stamp set and I simply stamped that and cut it out and placed that onto my image panel. My white card stock layer was first cut at 3 1/4" x 4 1/4" and then using my scallop trim corner punch I first punched the corners and then using the scallop trim border punch I punched along the edges. This technique only works for certain sizes so I wanted to make note of the size my card stock was. The glitter on my card is a little hard to see so I tried getting a better photo so that you could see it. I used my 2 way glue pen and some dazzling diamonds glitter and I went all along my scallop border edges and all along the edges of my 'to do list'. Below are two close up photos. Very sweet card! I love the sentiment. 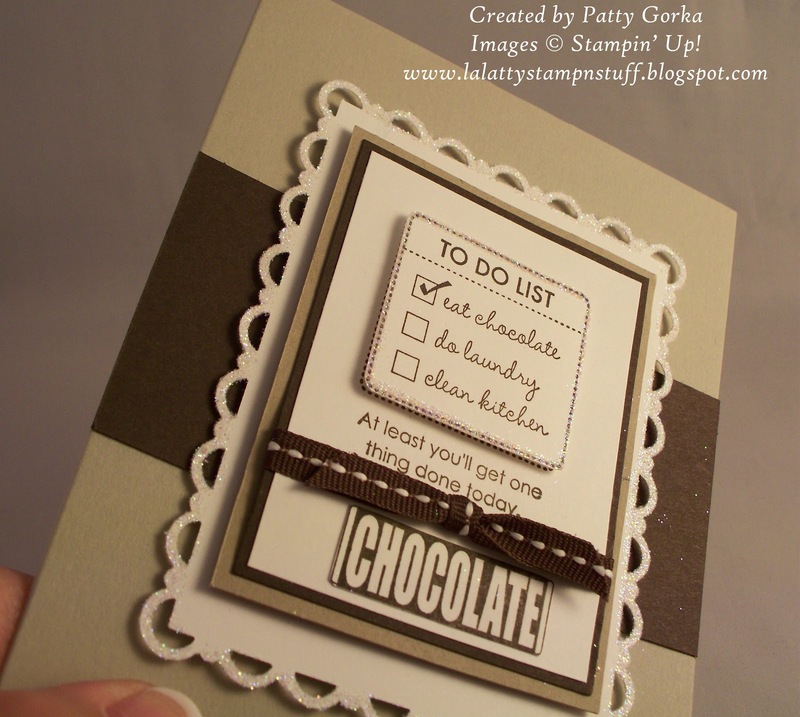 I like it Patty - and I like chocolate too! Fun card - thanks so much for the reminder on the measurements for the frame with those punches. I need to give it a try again. Love it Patty!!!. Very very cute!!!. I need that "to dlo list" as well!!! I love this card! Love the sentiment. 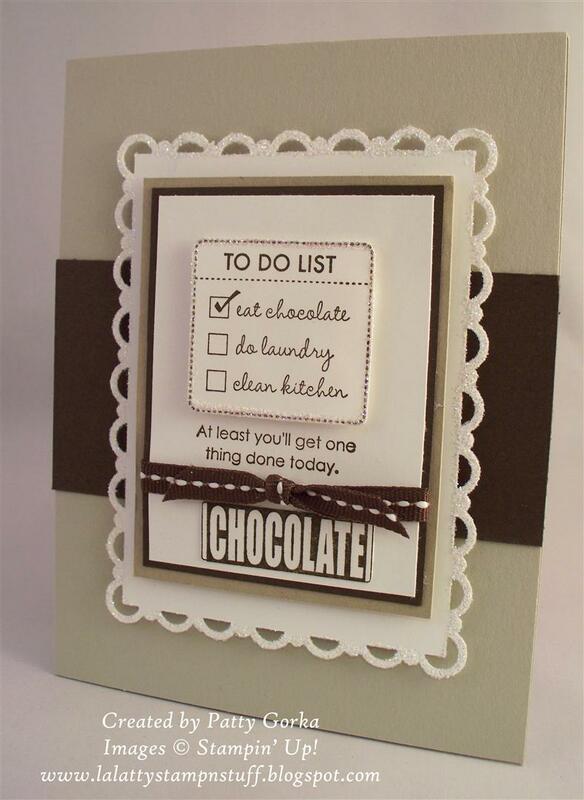 Definitely my kind of 'to do' list as well! Love the gorgeous neutral tones of this card and the scallop trim border is great!